Meall Glas and Sgiath Chuil are situated 4 miles east of Crianlarich village, 54 miles north of Glasgow, next to the A85 road. The image below is from the large car park across the road from the Glen Dochart Caravan Park, 6 miles east of Crianlarich next to the A85 road, 100 yards from Innishewan Farm road. That is Sgiath Chuil to the north, showing these mountains are a fair way out. Glasgow to Crianlarich Road Map . The image below is from the Innishewan Farm road leading to the mountains. This is the best place to view the mountains, and the best car park for these mountains, but said to be a tough route as there are no trails, just a long hike through moorland. Large Image . Sgiath Chuil Photo tour from Innishewan Farm. 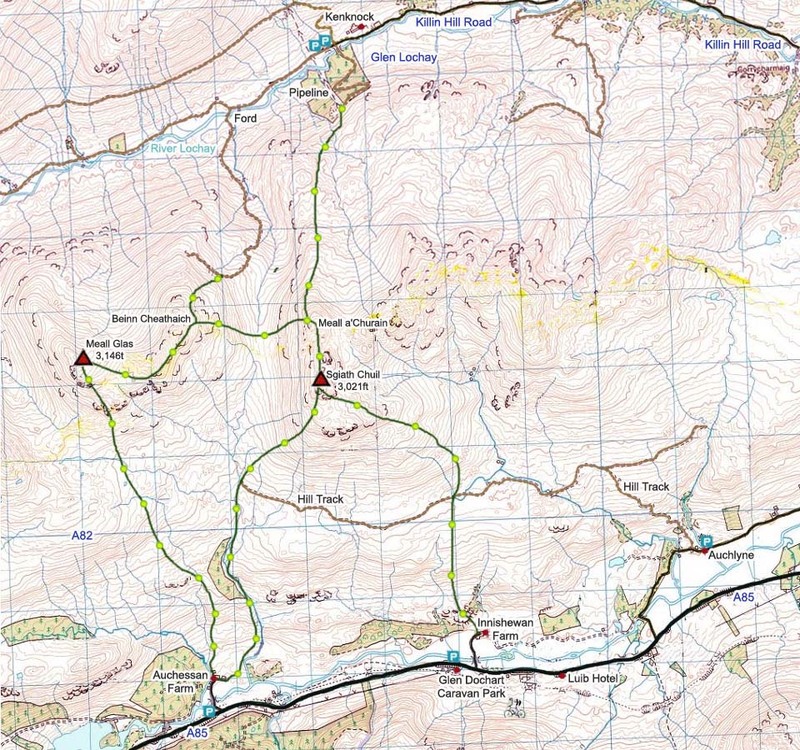 The map below shows the five routes onto Meall Glas and Sgiath Chuil. The main route from the south is from Auchessan Farm. The car parking for that route is on the roadside next to the entrance to the farm road, 4 miles east of Crianlarich. The roadside parking is wide, flat grass, so plenty of room for many cars. The Auchessan road is easy missed as it is narrow and goes through trees. There are some trails on this route, although easy to loose, and can be soggy in the lower sections. Meall Glas and Sgiath Chuil Photo Tour from Auchessan Farm. Auchlyne is a Mansion House, farm and a few cottages with a single lane road leading to it with many passing places. A hill track runs from Auchlyne to Sgiath Chuil, an ideal route for that mountain to avoid the soggy lower sections in wet weather. There are a few parking places at Auchlyne by the walled garden. The hill track leads up beside a cottage, by a small bridge and cattle grid. Auchlyne Track Image. Auchlyne Map drag the Wee Man onto the road for images. Auchlyne Route Photo Tour . The main route from the north is take the single lane hill road from Killin to just past Kenknock Farm where there is loads of parking by the large pipeline, about 8 miles west of Killin. There is an old hill road that crosses a ford, so waterproof boot covers or wading will be needed, then runs all the way up to the north side of Meall Glas and its sub peak Beinn Cheathaich. Another route is over a bridge then up past the pipeline towards Sgiath Chuil and its sub peak Meall a'Churain. Road Map drag the Wee Man onto the road for images. Other Accommodation in the area is the Luib Hotel, the Glen Dochart Caravan Park with camping, and Killin Hotels & B&Bs.